Two species of stream spreadwings (Archilestes sp.) live in Arizona: the Great (A. grandis) and the California (A. californicus) Spreadwings. These species are easily separated from pond spreadwings (Lestes sp. ) by their considerably larger sizes. The Great and California Spreadwings occupy similar habitats, in particular streams bordered with trees and bushes (esp. willows) and sometimes ponds. 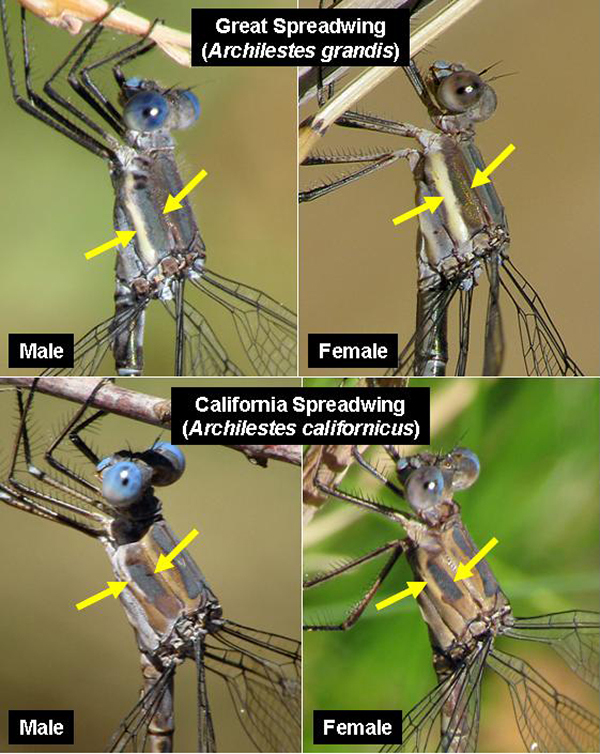 The two species can be found at a same location, but have a different distribution: the Great Spreadwing resides throughout the state whereas the known distribution of the California Spreadwing is limited to the Southeast corner of the state (Paulson 2009). The two species are separated in the field based primarily on the thorax color pattern and, in males, the shape of the appendages. Great Spreadwing: at maturity, thorax above is mostly dark iridescent green. Sides of the thorax have a complete and conspicuous pale yellow stripe. Anterior to this stripe is a dark stripe that extends almost to the base of the wings. California Spreadwing: thorax dull brown. Sides of thorax have an incomplete pale stripe. The dark stripe anterior to this white stripe does not extend to the base of the wings. Differences in thorax coloration apply to both sexes. The thorax of the male Great Spreadwing, in particular, can become pruinose with aging and this results in partial obscuring the above characters. Great Spreadwing: paraprocts hidden by cerci, hence not (or barely) visible from above. 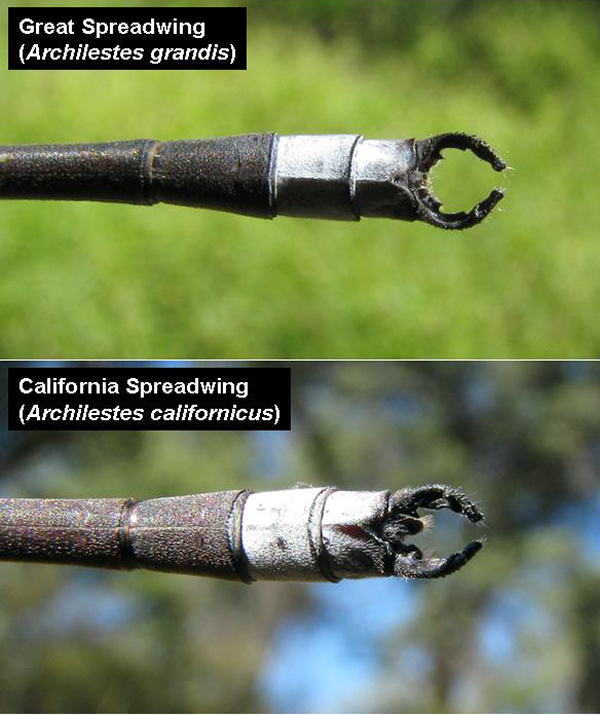 California Spreadwing: paraprocts are parallel and visible under cerci from above. Dorsal views of the appendages of the male Great and California Spreadwings, AZ.